Following its popularity last year, Class has once again produced a Progressive Fringe Guide to Labour Party Conference, a listing of the best progressive fringe events in Manchester. Our Guide is available to download below and will be available as a hard copy, given out every day outside Conference and widely circulated on stalls and at fringe events - all free of charge. 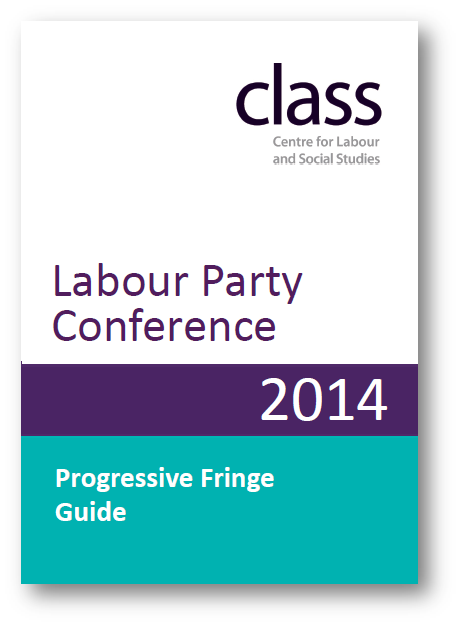 A pdf version of our Progressive Fringe Guide can be downloaded here. As with previous years, we are holding several fringe events in Manchester. Our first event is Wealth, Inequality and Power on Monday 22 September at 5.30pm, followed by What Britain Needs on Tuesday 23 Sept at 12.30pm. We also have the last in our joint Great British Rip Off series of events with unionstogether and the Trade Union Group of MPs on Tuesday 23 Sept at 5.30pm. Full details for each event can be found on the Events pages of the website, on social media and in our Fringe Guide. In addition to our events and Fringe Guide, we also have a stall (number 142) in the Third Sector zone in the main conference hall where hard copies of a wide range of our publications and material will be available to pick up, again free of charge.